Emerging key forward Josh Schache has spent just three years in the AFL system, but senior coach Luke Beveridge has no doubt he has the attributes to succeed at the top level. 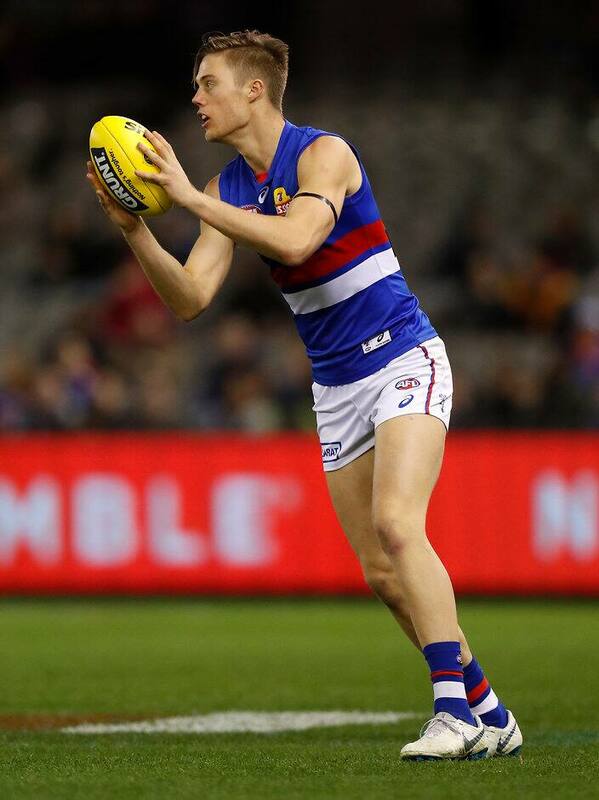 The 21-year-old joined the Western Bulldogs at the end of 2017, following two years with the Brisbane Lions. The former number two draft pick showed promising signs in his first year in red, white and blue, playing the final 13 matches of the season and kicking 17 goals. “He’s got good craft, he’s got a good engine and he’s really developing his contested stuff – we’re pleased with that,” Beveridge told SEN Breakfast. “We’ve tested him recently, just challenged him on a couple of areas and where we want him to run, how we need him to provide a contest in different areas. “He’s really come to the party there. Schache looms as a key player in the Dogs’ developing forward line without the injured Tom Boyd, alongside fellow young gun Aaron Naughton. Star midfielder Lachie Hunter thinks he’s ready to have an impact in 2019. “He’s had a really good pre-season,” Hunter told SEN’s KB and The Doc. “He’s been injury-free, and I know he’s put on a fair bit of muscle. He played pretty well last week (against St Kilda) and hopefully gets his chance. I hate to compare the pair, but had Bevo ever come out as strongly with Boyd? No player is perfect - especially a 200cm 21 year old - but I can't understand some of the negativity Josh attracted last year (and thsi year on a particular website). He has the footskills and the tank and generally runs to the right areas (although it's always going to be a work in progress for any 21 year old KPF). I'm pleasantly surprised at his output last year expecting him to take more time to add value to the side and was surprised he wasn't playing in JLT 1 a couple of weeks back. Kid is a Nick Riewoldt type who can kick. Exciting times. Hoping he plays as a roaming forward as opposed to a predominately deep forward. I like him and what he brings, but we are 18 month to 2 years away from seeing him dominate games regularly. If he can nail down a key forward spot, kick 20 to 25 goals that would be a pretty good year for him. We've talked about him a fair bit here about his prospects for the season and I'm genuinely excited about his future with us. Richmond created a lot of the rumors about him, as they wanted him cheap. We've all done well, I'm happy enough with our end with the belief I have in the kid. Richmond fell on their bloody feet. But this is the 2017-2018 movement if you believe Richmond went cold on Josh after a wink and nod from Lynch's manager and that's why he's with us. All netted first round, top 15 pick talents. I think we are already safely in second spot. If Josh gets to the level most of us think he can, hopefully we can try to nudge into first spot by end of career. I don't mind that above spread, all the list managers made it work in the end. Although it highlights that Vic clubs look to be poaching Qld KPFs while Qld clubs recruit some more players to poach in two years time. As to Josh, he was playing hit up forward, often on the best defender, to some guys who couldn't kick the ball near him on the full for him to effect a mark and impact more. I think any tough judges need to judge him if and when he starts getting good ball use. Three things we know already, he runs hard, is neat in traffic up the ground by hand and foot and is a very good set shot. More experience helps. Another pre season for strength and aerobic capacity helps. Playing more to gel with senior team mates helps (ie leading patterns to ball carriers and forward craft with other forwards). Being tested and responding well helps. The only thing is I wish Roberts wasn't our most experienced KPD for the year, and Josh wasn't getting the number one defender for the year. I hope there's not too much pressure and he can elevate his game on the expectation though. Still managed a goal a game. That's alright for a young tall, in a not so great team. Schache will continue to improve as will Gowers if Naughton stays forward who is class. Schache leads well and with Naughton’s aerial skills, they do complement each other. All of a sudden with the recruitment of Lloyd and Libba’s return not forgetting another ace in Bont we begin to have some potency in attack. Playing Hawthorn on the G will be a good test as to how far we have come in a forward line that had looked very ordinary in the past two seasons. I don't mind if he only occasionally has games like Sunday but I want him to keep up the aggression and workrate that he's shown in the two games so far. You'll always have nearly games but if you are making defenders aware of everything you do then that's extremely valuable. Schache is turning out to be a good Forward/second ruck. Two of his goals were scored when he was in the ruck. I read that he played his junior days as a ruck before he got to the under 18's. He is clearly playing with an aggression he didn't have last year. He's 200cm, 21 years old and can kick straight. Grabbing a pick 2 with two years in the system for a 2nd and 3rd rounder may well be considered one of the great heists of modern trading as his career progresses. Big upgrade on Stringer and throw in Richards with those picks.